New Rochelle, March 6, 2019–A new study describes the Science Operations component and new results from NASA’s Biologic Analog Science Associated with Lava Terrains (BASALT). The goal of BASALT was to provide evidence-based recommendations for future planetary extravehicular activity (EVA), simulating in particular the conditions associated with conducting human scientific exploration on Mars. 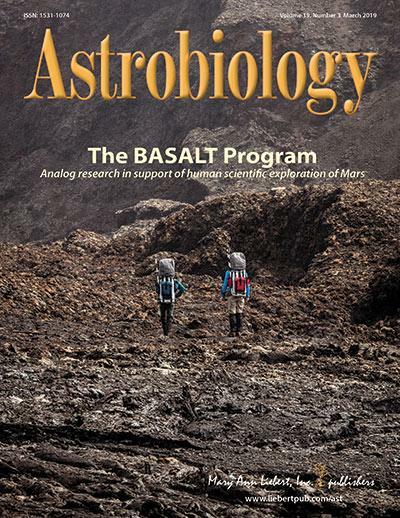 The article appears in a Special Issue on BASALT led by Guest Editor Darlene Lim, PhD, NASA Ames Research Center and published in Astrobiology, a peer-reviewed journal from Mary Ann Liebert, Inc., publishers. Click here to read the entire Special Issue free on the Astrobiology website.
) was lead-authored by K.H. Beaton, KBRwyle (Houston, TX) and NASA Johnson Space Center (Houston) and a team of researchers from these institutions, Jacobs Technology (Houston), Idaho State University (Pocatello), McMaster University (Hamilton, Canada), University of Edinburgh (Scotland), BAER Institute (Moffett Field, CA), and NASA Ames Research Center (Moffett Field). In the article, the researchers focus on the study design and results of the second field deployment of BASALT. They describe the overall scientific objectives and rules of the EVA, critical capabilities needed for science-driven EVAs and specific activities such as sampling and communication, EVA distance and duration of deployment, individual roles and responsibilities of the extravehicular and intravehicular crews, needs for data and image capture. They also present recommendations for future directions and subsequent research objectives. Astrobiology, led by Editor-in-Chief Sherry L. Cady, a Chief Scientist at the Pacific Northwest National Laboratory, and a prominent international editorial board comprised of esteemed scientists in the field, is the authoritative peer-reviewed journal for the most up-to-date information and perspectives on exciting new research findings and discoveries emanating from interplanetary exploration and terrestrial field and laboratory research programs. The Journal is published monthly online with Open Access options and in print. Complete tables of content and a sample issue may be viewed on the Astrobiology website. Mary Ann Liebert, Inc., publishers is a privately held, fully integrated media company known for establishing authoritative peer-reviewed journals in many promising areas of science and biomedical research, including New Space and High Altitude Medicine & Biology. Its biotechnology trade magazine, GEN (Genetic Engineering & Biotechnology News), was the first in its field and is today the industry’s most widely read publication worldwide. A complete list of the firm’s 80 journals, books, and newsmagazines is available at the Mary Ann Liebert, Inc., publishers website.